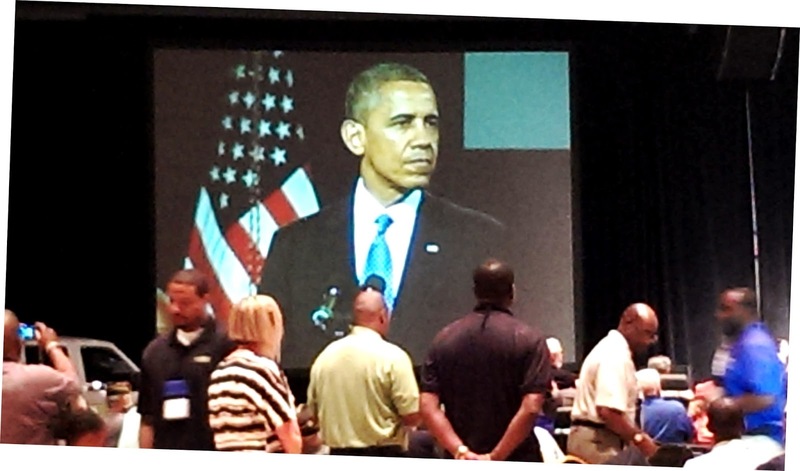 Recently, Merlinda Helmick, enrollment advisor for the Fort Stewart campus, had the exciting opportunity to attend the Disabled American Veterans national convention in Orlando. Because Merlinda regularly works with military students and veterans, the event was particularly meaningful to her. Merlinda shares her experiences of the event and what she learned about how government agencies and colleges across the country are working together to make higher education more military-friendly. 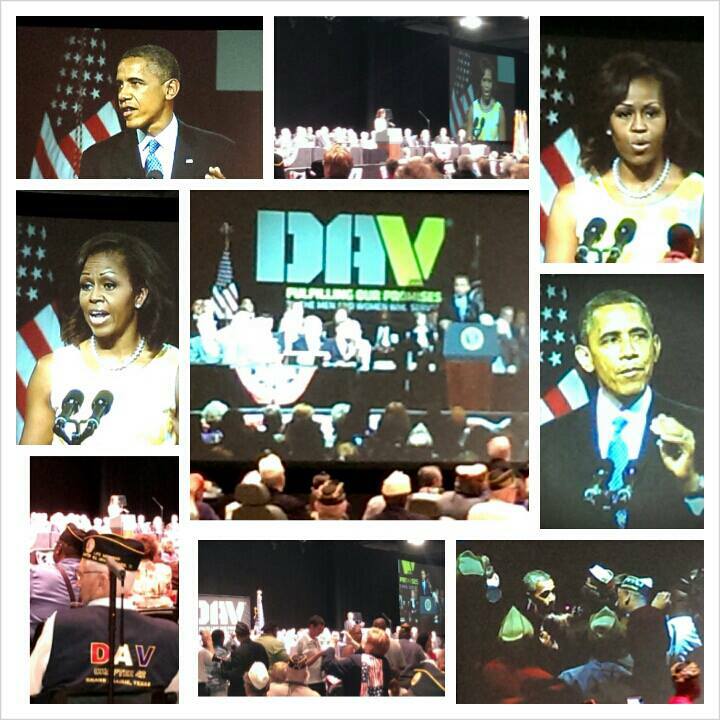 "Disabled American Veterans (DAV) is the most enduring veterans' assistance organization in the country. It's chartered by Congress and dedicated to empowering veterans to lead high-quality lives. However, a lot of our students are not even aware of its existence. So, each time I encounter a student, I feel compelled to educated them about this organization and the services it offers. 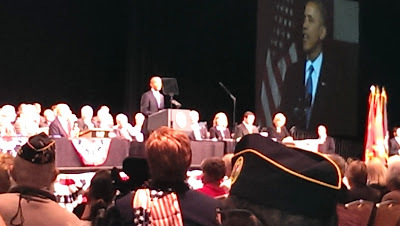 Seated in the middle of the Hilton Orlando grand ballroom among nearly 4,000 injured veterans and guests, I had only my cell phone with me for taking pictures. Taking close-up photos of the speakers onstage was a challenge, so I resorted to taking photos of them as they appeared on the big screens located on both sides of the stage. In August, the DAV held a national convention, which I attended as a delegate along with my husband, who is the chapter commander in Hinesville. President Obama and the First Lady spoke on the first day, Aug. 10th. 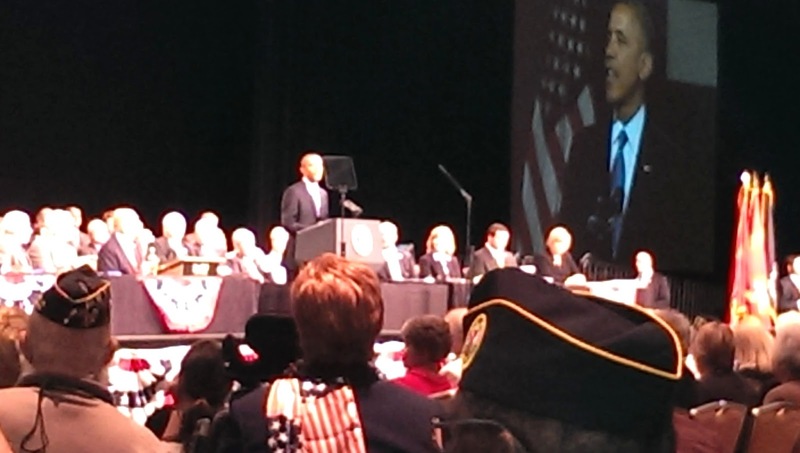 President Obama's speech included an outline of his administration's five priorities, which include supporting veterans in institutions of higher learning. In his speech, the president announced that 250 community colleges and universities have committed to implementing the "Eight Keys to Success" on their campuses. Developed by the Obama Administration, the Department of Education and the Department of Veterans Affairs in conjunction with more than 100 education experts, the Eight Keys to Success on campus are concrete steps that institutions of higher education can take to help veterans and service members transition into the classroom and thrive once they are there. 1. Create a culture of trust and connectedness across the campus community to promote well-being and success for veterans. 2. Ensure consistent and sustained support from campus leadership. 3. Implement an early alert system to ensure all veterans receive academic, career and financial advice before challenges become overwhelming. 4. Coordinate and centralize campus efforts for all veterans, together with the creation of a designated space (even if limited in size). 5. Collaborate with local communities and organizations, including government agencies, to align and coordinate various services for veterans. 6. Utilize a uniform set of data tools to collect and track information on veterans, including demographics, retention and degree completion. 7. Provide comprehensive professional development for faculty and staff on issues and challenges unique to veterans. 8. Develop systems that ensure sustainability of effective practices for veterans. With this in mind, it motivates me to better deal with and help our student veterans. It was an honor to attend the DAV national convention, and I look forward to applying what I learned to my work at Columbia College." Transition from military to civilian life hasn't been that easy especially if you don't have a degree. I am glad that I've chosen Columbia College to pursue my degree. I am also a veteran and a member of DAV, and yes, not everyone knows about it. Thank you for this posting article, this only shows that veterans like me have a place in Columbia College.